If you want to conduct a survey in various languages you do not have to create a survey for each language separately. An existing questionnaire can be translated into different languages. First you should completely build the questionnaire in one language (template). You better not start with the translation until the main questionnaire has not been created entirely. 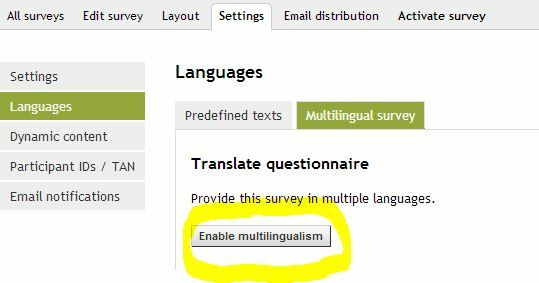 The multilingualism can be activated in “Settings > Languages > Multilingual survey“. By choosing a default language all predefined texts (error messages, etc.) will be automatically translated. 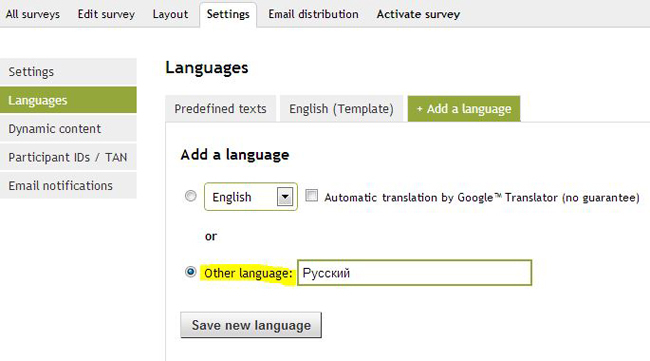 When the option “Automatic translation” is activated, the whole questionnaire is automatically translated using “Google Translate”. You can modify these translations afterwards. Other languages: If the needed language is not one of our default ones, you can add it manually. That way no automatic translation is done. You’ll have to enter all translations yourself (incl. error messages, etc.). Highlighted with a grey background is the text from your template questionnaire. Just below you can enter the appropriate translation. Content that does not need to be translated (e.g. numbers) can be copied with a simple click on the down arrow on the left. Text fields already containing text will not be affected. Please do not forget to save the entered translations (at the bottom of the page). If you do not want to translate the questionnaire by yourself, you can grant third parties access to your translations via a translation link. With this link third parties only get access to the translation site and solely to the respective language. The questionnaire itself cannot be changed. A different unique link is generated for every language. Unchecking this option revokes access immediately. PS: By default the template language is shown as the basis of the translation (English in the above mentioned example). Sometimes it is required that another language is used as template (e.g. 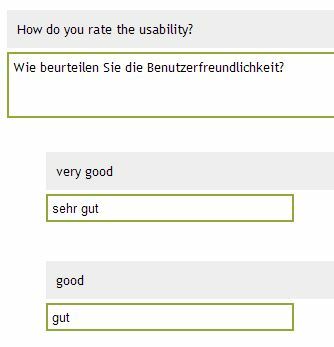 a questionnaire was created in English (template) and then translated to German. 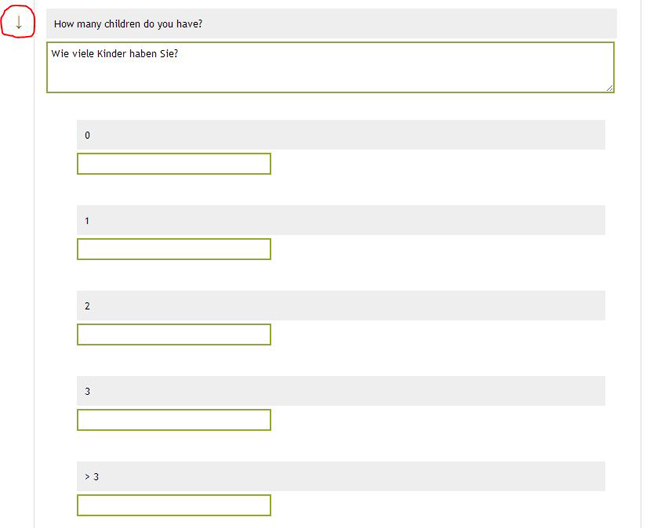 Now the questionnaire needs to be translated from German (and not from English) to French. For this purpose the language code of the respective language has to be added to the translation link (e.g. www.esurveycreator.com/translation/1234567-hijklmn&language=2). The number “2” in this code represents the language code, which can be found in the URL by selecting the required language. As soon as the above mentioned steps are completed, the language selection will appear at the beginning of the questionnaire. Do you already know the language of your participants? 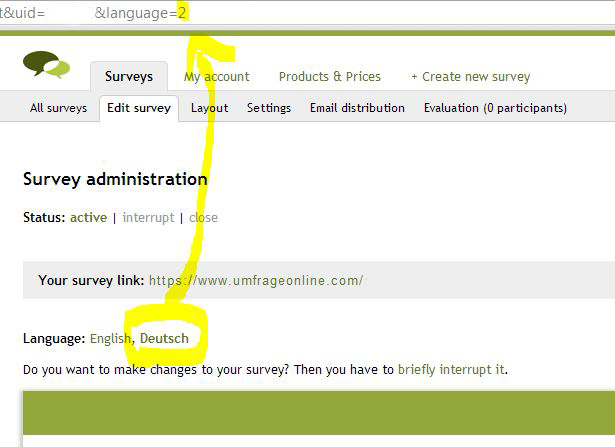 Then you can modify the survey link in order to skip the language selection and directly show the correct language instead. Now, when a participant opens the modified survey link, the language selection is skipped and the questionnaire automatically starts with the first page of the questionnaire in the selected language. The chosen language of a participant can be retrieved in the raw data export (e.g. in Excel) of your results. 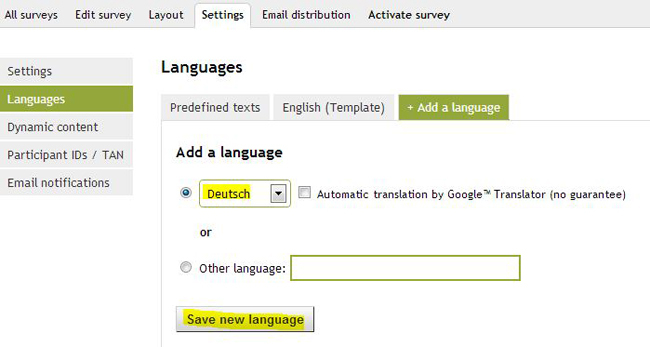 It is also possible to filter by language in the online evaluation. Posted on December 28, 2013 December 30, 2013 Author Pascal SchenkCategories What's New?